Florida Boulevard begins to flood on the morning of August 13, 2016. A shot of Montgomery Avenue on August 13, 2016 around 5:15 a.m.. The houses taking water across the street from the photographer were four feet off the ground. Most homes in the area would take anywhere from four to six feet of water. An aerial view of the Denham Springs flooding, taken Aug. 14. Debris in the Colyell Creek near Hood Road has led to clogged waterways. Funded gravity drainage could help with cleanup of wooded areas, including this portion near Maurepas. LIVINGSTON — Thirty-one inches of rain on the weekend of Aug. 14, 2016, brought the worst flooding in more than a century to Livingston Parish, and reignited discussion on what has been a heated topic over the years. Maps of Livingston Parish illustrate an abundance of waterways, but not all areas of the parish have the same level of infrastructure to move water in flood events. Public officials agree unanimously that infrastructure and better drainage systems probably would not have made much of a difference during the Great Flood of 2016, but areas without dedicated funding for gravity drainage would fare better in lesser events. “Nothing would have been able to stop anything like the 2016 flood,” said Mark Harrell, director of the Livingston Parish Office of Homeland Security and Emergency Preparedness. Officials also agree that the long-awaited Comite River Diversion Canal – had it been completed in 2016 – may have not made a significant difference. Voters in the south and east part of the parish last year nixed proposals that would have funded gravity drainage and maintenance for two districts which would have covered more than three-quarters of the parish. The tax proposals for districts 5 and 7 failed resoundingly. The failure disappointed parish officials, but did not surprise them. “Everyone supports drainage, but they’re absolutely against taxes,” Livingston Parish President Layton Ricks said. “They expect you to do the best you can with what you get because we still have a lot of people hurting because of the flood. Larry O’Neil, head of the unfunded Livingston Parish Gravity Drainage District 7, believes he and others who promoted the millage could have done more to educate the public. He knew it was a tough sale, but he said an earlier start and more education on the importance of a funded district may have drawn more voters to the issue. Another group was far more aggressive, however. Several grass roots coalitions – some possibly from outside Livingston Parish -- used social media posts to draw residents away from the tax proposal, a move which nailed the door shut on the tax measure. The proposal also drew fervent opposition from the Village of French Settlement, a community of 1,200 residents who endure flooding on a regular basis. Lawrence Callender, who oversees emergency preparedness for the village, opposed the measure because it did not include the village in representation. “A presentation was made to us at a Town Hall meeting by the gravity drainage board, and that was the first they heard about it, and they had already picked a board, an engineer and the projects – and none were in French Settlement,” he said. Livingston Parish Councilman Shane Mack, who represents the Albany area, said failure of the tax has kept his area in the same rut it has endured for years. Parish Council member Tab Lobell, who represents the Springfield/Killian area, believes he and his fellow council members took a step in the right direction, even though voters rejected the proposal. The efforts to fund gravity drainage in the southern and eastern parts of the parish marked the first attempt by the Parish Council to create parishwide gravity drainage. “Did we have every possible facet of it figured it out? No,” he said. “But nobody in the history of our parish in our area had taken this approach. The antitax sentiment still played the biggest role in the failure, said Jeff Ard, District 5 councilman and chairman of the Parish Council. He said he could not fault voters who rejected the proposal, but he also warned that they should not expect drainage problems to subside. The parish’s limited resources also block any chance of cleaning areas in unfunded districts, O’Neil said. He believes residents see the need for drainage, but do not realize that the parish does not have the funds to carry out gravity drainage on a regular basis. “The need is there, but you can’t convince people of what’s necessary to put those needs in place,” he said. “Plus, turnout was atrocious in the election, so a lot of people just did not have civic pride and wouldn’t go out and vote. Whether a proposal will go back to the voters in the near future remains uncertain. Ard said he would not support the measure because, “The people have spoken,” while Mack said he plans to explore ideas to fund gravity drainage across the parish without a new tax, but it would take a lot of time to formulate the plan. Mack does not believe consolidated drainage would work. “It’s not a bad idea, but I don’t want to destroy what currently exists on the west side of the parish, which has worked well for those districts and the people of those areas,” he said. It may take another hurricane or mammoth rain or flood to see if residents would reconsider the millage issue for gravity drainage, O’Neil said. Harrell does not believe one single project will fix the problems. Owners of Statewide Insurance Group move metal filing cabinets out on an air mattress. A soldier from the Louisiana Army National Guard puts a toddler on board as part of a rescue mission Sunday in Denham Springs. Louisiana National Guard troops assist evaucees off a toppled rescue unit Sunday. No injuries were reported. A resident's car is submerged in floodwater along Pete's Highway after more tha 20 inches of rain soaked Livingston Parish and other parts of south Louisiana. Heavy rains Friday left a home several feet underwater in a Watson subdivision near the Amite River. Sheriff Jason Ard urged evacuation of the area before daybreak Saturday. Evacuees walk from a toppled military rescue vehicle Sunday along Pete's Highway in Denham Springs. The displaced residents were immediately transferred to another vehicle and transported safely to an evacuation center. Louisiana Army National Guard soldiers help an elderly man climb into a covered bed of a tactical vehicle during a rescue mission Sunday. Application process has been sluggish for home elevation or demolition and acquisition for homes affected by the August 2016 flood. The program is offered through FEMA. 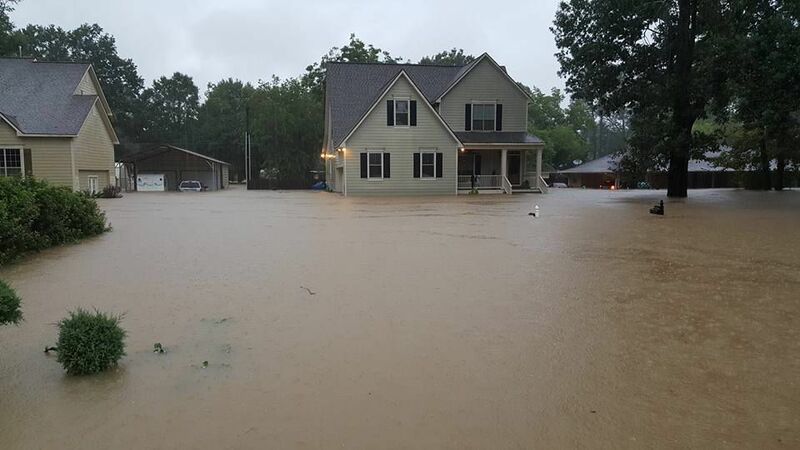 Rainfall also brought severe flooding to homes in the Holden area Friday. Livingston Parish President Layton Ricks speaks in a news conference Saturday morning at the Governmental Building about evacuation efforts amid heavy rainfall and historic flood levels throughout the area. He is seen with Livingston Parish Office of Homeland Security and Emergency Preparedness Director Mark Harrell and Livingston Parish Sheiff Jason Ard. A crowd of more than 100 residents endured rain, heat and humidity Saturday and Sunday as they waited for a National Guard troops to bring them to evacuation centers across Livingston Parish. A storage rental facility was one of the many busineses that sustained damages along Pete's Highway in Denham Springs. A convoy of 18-wheelers remain stuck in park along Interstate 12 Saturday evening after severe flooding prompted the state Department of Transportation and Development to close the artery. Louisiana National Guard soldiers transferred evacuees from a military tactical vehcile that nearly flipped Sunday along a curve on Pete's Highway. No injuries were reported. The Anthony "Tony" Dugas North Park Recreation Center in Denham Springs accommodate approximately 200 evacuees Sunday night. Most of the residents were rescued from areas on the southern end of Denham Springs. Is the Great Flood of 2016 an example of a 1,000-year flood?